Losing Maddie – A Year Later | Breezy Mama Breezy Mama - Expert parenting advice, celebrity interviews, product reviews for kids, moms and babies and more! Today marks the one year “Angelversary‏” of Maddie’s passing. Kajsa reflects on the last year–from how she’s coping with the loss of a child to how she’s continually feeling Maddie’s presence . . .
People ask me all the time how I am doing. My response is usually, “I’m OK.” I say this because I don’t think most who ask really want to know the truth: I am not OK. A year ago today I watched my only child die in my arms. I think I’d be pretty messed up if I were OK. I hear the term “grieving process” too frequently. “Process” being defined as “a systematic series of actions directed to some end.” Those who have lost a child know this term doesn’t exist. There is no end to this grieving. We will never heal. There is no getting over this. I have come to accept that sorrow will be a companion of mine for the rest of my life. I have learned to embrace it and not feel wrong about having it as a friend. This does not mean that there haven’t been moments of happiness this past year; it just means that it’s a different sort of emotion. Happiness is always laced with a little bit of sorrow, and that’s OK.
It’s “anguish” that is no friend of mine. “Severe mental or physical pain or suffering,” is a term that’s definitely in my vocabulary. I have a broken blood vessel under my eye from wiping away one too many tears, I’ve lost a bunch of hair that is finally starting to grow back, and I get frequent migraines. I feel extreme anxiety when meeting new people because I fear the question “Do you have any kids?” is moments away. All in all, if my biggest obstacles are a little extra concealer, a new hairstyle, and a few headaches . . . I think I’m coping pretty well. Twelve months in, the anguish has started to slightly subside. I believe this is a result of me being honest with myself about what I am and what I am not capable of. I’ve tried to make this new world of mine as protective and secure as possible. My friends and family have been amazingly patient and supportive in this process. I’ve only seen my four sweet nephews a few times since losing Maddie. There have been family dinners that I’ve had to run out of because all they did was remind me of her not being there. My mommy friends know the things to invite me to and the things to shelter me from. It’s painful to see Maddie’s friends getting older and growing taller. There were no birthday parties, no play dates, and no holidays this past year. I spent Mother’s Day, Halloween, Thanksgiving, and Christmas very far from home, in new places where the beautiful memories I have with my beloved daughter were not around every corner to emotionally punch me in the stomach. I hope that one day I’ll be able to celebrate on some level, but this was not the year for that. As much as I have tried to create an emotionally war-free zone to live in, it’s inevitable that I encounter some land minds along the way. Going to the grocery store is tough, and there are certain aisles that I always steer clear of. I don’t need to see the new Scooby Doo fruits snacks because I have no one to buy them for. I try to watch only recorded shows on TV; being able to fast forward through Disneyland commercials with girls twirling in princess dresses or hospital ads with children going into MRI machines is well worth my monthly DVR bill. The radio is never turned on in my car. I’ve got nothing against The Band Perry’s hit “If I Die Young,” but I couldn’t be happier when that song finally falls off the charts. Some things are not so easily defused. You can’t control when you decide to clean under the couch and find a little school sock covered in glitter, or open a kitchen drawer and pull out a favorite ocean-themed dinner plate. Checking the mail is a necessity, even when the Ocean Institute’s summer camp brochure is delivered. People grieve in many different ways, and I believe as long as they aren’t hurting anyone else, they should be able to do whatever it is that makes life going forward the best possible. Some people leave their child’s toys around and keep the room exactly as it was. Others pack every last memory away. I didn’t do either of these things. I divided all of Maddie’s toys up and gave them to her friends that love her. I know to this day that those toys are played with often and in some sense are sources of comfort to the innocent children that miss their friend. I live in a small two-bedroom condo. Maddie’s room was directly across from mine and decorated like a garden with a green shag rug as grass, big vinyl decals of bright colored flowers on all four walls, and a sun with clouds up above. The first few months after her passing I would lie in her bed, hold her pillow tight, and just sob. I couldn’t bear the thought of changing a thing, but as work on her Foundation’s behalf increased, my kitchen countertop just wasn’t cutting it as a workspace. So I decided to turn her room into a guest room / home office. I did it alone. I peeled off every last flower and butterfly decal from the walls by myself. This was something I needed to feel, to really lean in to. As heart-wrenching a task it was, it seemed only fitting to use the space for my work in honoring her memory. Similarly, I hadn’t found the strength to take her car seat out of the back of my car. It was only when I was loading boxes of supplies to the Reaching for the Sea Stars Gala that I was able to move her seat and make room for all the invitations—invitations to a fundraiser in her honor. Whether I had packed up every last thing or kept it all exactly the same, her memory and spirit will always surround me. I’ve kept a box of all her favorite things. I have my cherished photos of her still displayed throughout my home, like this one of the two of us when we were around the same age. 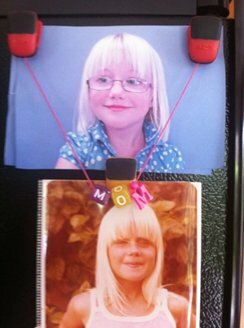 These are on my refrigerator with a charm she made for me just before her diagnosis. I meditate and visit her in heaven and picture her happy and cancer free. We have the dinner parties I promised her we would have, and we don’t get any ketchup on her wings. I spend as much time as possible in or near the ocean. I paddleboard past the future site of the Maddie James Seaside Learning Center often. I wear the lavender lotion I used after her very first bath, the same lotion I used after the last bath I took with her just days before her passing. I find comfort and strength in its scent. I feel so connected to her that sometimes when I’m having a rough day, I make sure and talk to her and tell her that Mommy is OK. I don’t want her to be sad for me. I know she is in a better place, and she gives me signs of validation all the time. It’s remarkable what is possible to see if you just open up your heart and mind to it. I’ve never been an overly religious person, and yet I’ve never been clearer in my beliefs. Losing a child is one of those things that either takes you one direction in your faith or the other, and mine has never been stronger. But that faith is mine and is something that is very personal to me. Unfortunately, I’ve had people write to me and say, “I hope you are saved so that you get to see your daughter again one day.” I’ve attended Foundation events where strangers have pinned me in a corner and insisted on putting their hands on me and lifting me up in prayer. I pray all the time, and I am thankful that people keep me in their prayers, but at public events with strangers I have about a “two-lift” maximum before it’s time to get out of Dodge. Those two statements are definitely not recommended. Have there been deeply dark days I’ve been tempted to take a little pill to make it all go away? Absolutely. But then I know how it feels to lose a child, and I would never do that to my own parents. I have a lot of living left to do. It won’t be the life that I wanted to live, but it can still be a good life. A life surrounded by Maddie’s spirit. A life spent with my friends and family. A life dedicated to protecting the ocean she so loved, a place I firmly believe her sweet soul is at rest. In a year of horrific tragedy and loss, a lot of beauty has come out of it. I choose a life of remembering that beauty. I just wanted to say that I understand. My twin girls died at 23 weeks in August 2011. It hasn’t been a year yet, but I am finally starting to feel more hopeful again. I understand the pain, and the crying, and the avoidance. I had trouble going into stores and looking up because I might see a family with a new baby. Even worse was seeing a family with newborn twins. I have had days where I felt no one understands – and that’s okay. I would hate for others to understand because that would mean that they had gone through what I did and I wouldn’t wish that on anyone. Our girls can play in the trees together and be the starlight. Thank you for sharing Kajsa. I’m crying with you right now after reading your story. I wish you strength. Love you Kajsa, thanks for sharing. Thank you for sharing. I’m deeply moved by your words. Kajsa, thank you for sharing. I am thinking of you and sending you lots of love today just as much as I think of you everyday. You are so loved and so is Maddie. I can’t wait to honor sweet Maddie by walking in just a few weeks! Thank you for sharing, Kajsa. Love and Hugs. Thank you for sharing with us… I am sobbing. I just can’t begin to imagine what you go through and what you will continue to go through. Your strength and intelligence are awe-inspiring. I miss Maddie so much. Reading kasja’s story today and all that she has gone through is so heatbreaking. She is a strong woman!! Thank you for sharing your story. Thank you for sharing this Kajsa. There really has not been a day that has gone by this past year that I haven’t thought about Maddie and you. I can see my turtle sticker on the back of my car every time I look in my rear view mirror. Please know you are thought of and loved. Hugs today and every day. Thank you Kajsa for sharing such a painful, personal and emotional firsthand account of the loss you will forever feel. You are a brave woman and you inspire many! I made the mistake of reading your passage right before classes began; I couldn’t teach first period…so far. Your words were so clear. So poignant. So affective. Words fail, and seem trivial, so I’ve never said anything to you; I’ve tried to have my actions speak when I could not. My appreciating for the MJF grows every time I think of you, and the rest of your family. Thank you for sharing all of this, Kasja. It is every parent’s worst nightmare, and then some, and there are just far, far, far too many people who have gone through it… any number above 0 is just wrong, and unfair beyond belief. I admire your strength, honesty, and focus on your beautiful little girl’s spirit and energy… both of which will live forever, in part because of how you’re helping to keep them alive. You are an amazing mother and person. Your words are so beautifully written and in such a way that I can feel how you or anyone who has lost a child…actually feels. Thank you for opening up and sharing your thoughts and feelings about your precious Maddie. Thank you for sharing, you are thought of and loved. I can not begin to imagine the emotions you are experiencing today and wanted to say thank you for sharing your letter with us. As you grieve, know that we are remembering you and honoring the memory of your sweet Maddie each and every day! Your strength and courage are an inspiration to so many who are blessed to know you and have you in their lives. Thank you for sharing so much of yourself with others! I truly appreciate your honesty. Thinking of you today and always!! There are buckets of tears streaming from my eyes. What a brave and wonderful post. You and your daughter are so loved and I thank you so much for sharing your feelings with us. My heart goes out to you. Kajsa, you are an amazing writer with the perfect words for telling others your story. I, on the other hand, have no words. I can only send my hugs and tell you that your loss is so deeply felt. My eyes, too, are streaming, and I really don’t care if I recover today or in the next week. My friend, you are a wonderful mother to a beautiful little girl… whom awaits you in heaven. How can anyone find words to say! Your pain is so strong it takes one’s breath away. I think of you and Maddie very often even though I didn’t know you, I knew your little girl who left a sunshine impression first time I saw her at school. My dad had just passed away in front of me the day I learnt Maddie was sick, it was the straw that broke my back. Your words are so true, your description of things said like “grieving process” is so accurate. I pray for strength for you and that your days -one at a time – will be kind to you. I want you to know that everytime I see Maddie’s photo, I think of sunshine and not her passing away. She’s certainly present, we just don’t see her. As you have done from the very begining of this journey, you so eloquently express the raw emotions you have experienced! You are without a doubt the most couragous person! I didn’t get past the first paragraph before the tears streamed down my face. Death leaves a heartache that cannot heal, but love leaves a memory no one can steal. So to you Kajsa, my fervent prayer is that your cherished memories of Maddie continue to keep you company, just as her angel spirit is doing today. Kasja, you are an amazing writer! Thank you so much for sharing that it’s okay not to be okay — such a true statement! I am picturing Maddie in heaven happy and cancer-free, too! Kajsa, you are truly an amazing person and I can’t thank you enough for your honesty and courage in sharing your story. I think about you and Maddie often and am truly inspired by your kindness, dedication, strength and, most importantly, your love. I continue to keep you in my thoughts and prayers. You’re such a strong woman Kajsa. The work you’re doing to carry on Maddie’s memory is so impressive. Kajsa what strength that took. I am so thankful you were able to share. I recall reading about your story a year ago when I first moved to the area. I can relate to your pain. I live with the pain everyday of losing my daughter. It doesn’t ever leave you, your life is forever changed. I found comfort in knowing what I feel and go through is normal of someone losing a child. I pray you continue to see Maddie, and enjoy her presence. And relish in the special bond you two shared; and do share. I remember always praying that my daughter knew how much she was loved. Kajsa, you are amazing. I’ve always admired you–you’re beautiful, funny, smart. But in this, you’ve proven yourself to be extraordinary–a truly amazing woman. To share such raw emotion openly, know that you have touched the hearts of many and we are with you. I know Maddie is smiling down on you every moment, so proud of her mama. I will continue to pray for you, but no laying of hands or lifting you up. I promise. I have never met you but we have a few mutual friends. I am so sorry for your monumental loss. Thank you for sharing your story. I have no doubt that it will someday help someone else. Such a beautiful post. Thank you for sharing your beautiful Maddie. I too have heard those unthoughtful words. You want to believe people mean well however the words are so painful. Even 7 years later, I hear “can you imagine if you would have had 2 children to take care of at once?” I do have 2 living children now however one is 7 years old (his twin sister died at 19 days after being born with a rare genetic disorder) and a 6 month old. Oh and those who told me it must be nice to finally have a daughter. Of course because she is alive!But having my 6 month old daughter did not take away the sorrow that will always be there for my first born daughter. Thinking of you and MISSing Maddie with you. kajsa-we haven’t formally met, but we waved at each other through several people at a mutual friend’s birthday party…you complimented an owl plate i had given her. your smile was just as pretty in person as in all the photos i had seen of you and maddie. i had no “real” words to say then. and again i saw you…my two exhausted girls were hanging on me while i annoyingly pushed a stroller full of stuff to the car. the sight of you made me clench my girls tight reminding me that all of “this” could be taken away. again, i had no “real” words to say then. and to be honest…i will never have the real words to say that would ever fully express how sad and angry i feel for what you were/are going through. so if i ever get to meet you i would really just like to give you a hug in hopes of trying to lift off an ounce of weight that you’ve had to carry this past year. i hope that would be okay with you. Kajsa, I have followed your story through this blog and I am so sorry for all that you have been through. You have expressed your grief so poignantly, I am sitting here with tears running down my cheeks. Although I did not know your beautiful daughter, I am proud to have supported her foundation; you are an inspiration to us all and I wish you the best as you continue work through your grief. Valentine’s day marked a year for my sweet Sydney’s passing. My year has gone similarly to yours. Sydney was five years old and also died in my arms. I cherish that and wouldn’t trade it for the world. I don’t have much else to say other than I felt inclined to write you and let you know I understand every single word you have written. You are not alone, and can always reach out to me, if you would like. Continue to take care of yourself. You are definitely one of the most strongest woman I know. Please know that I think of you and your sweet Maddie often. Hugs and Prayers, erika. Kajsa-your strength has always been an inspiration to me, but your honesty and willingness to share your feelings during this difficult time (past, present and future) is just astounding. I am so proud of you for being able to tell it like it is and letting us all share your grief. Wish there was more than I can do by just writing this little tidbit, but know that you are thought of, prayed for and know that we are crying with you…. Anniversaries,birthdays, random moments. Wishing you continued strength in all of them. Kajsa – Your strength is inspiring. Thank you for having the courage to share your raw emotion. You are an amazing woman and an example for all. Virtual hugs to you. That was an amazing, emotional and inspirational illustration of your life now. As a father of two daughters who mean more to me than life itself, I feel your pain and sorrow. You are an awesome mom and the world is a better place because of you. Thank you for so eloquently sharing your story. You daughter was beautiful – the two of you looked so much alike at the same age! She was a very lucky girl to have you as her mother. Thank you so much for the update. I often wonder about you and how you are doing. I sensed that you were a private person, and we would hear from you on your time…which is great. Maddie was a beauty and believe it or not she has helped me. She has helped me to appreciate my daughter and not be so quick to get upset or aggravated…to enjoy her because you just never know. I am continuously praying for you. For guidance and for compfort. Many Blessings. Thank you for sharing your heart. You just can’t compare one loss to the other. I struggle, still, with the loss of my husband and the new life that it has created for me, and he died 10 years ago leaving me with two small children. Our losses may be different and the consequences are also different, but many things you said in this post resonated with me and my loss as well. Creating a safe place, establishing boundaries, and telling people you are ok when you really are not ok, are just to name a few. I have found that complete honesty is so important in getting through my very rough times. Grief is not something that will ever end, however I have found that I seem to be so familiar with it now that I have just learned to almost make it a companion. Sometimes that companion is very silent, and sometime that companion is loudly stepping in my way of living my life. You are also right that death causes us to look at our faith closely. And again, honesty is the best policy. To all those mothers who have lost their beautiful, special children, my heart goes out to you, because I am one. My daughter, Alison, died at 4 and1/2 years old of a malignant brain tumor. As time passes, you become more philosophical about it and stop looking for the reason. Always missing them and remembering how wonderful they were. Iworked as an RN on a cardiovascult ICU for years. In 2001, my husband died of cancer. I was asked by a friend to work at Hospice. I told her no, that I didn’t think I could handle it. She asked me, “Who better than you?” I tenatively transferred to Hospice for what was to be a 6 month trial. I am still there 6 years later. During that time, my 25 year old daughter develped 2 cancers at once. These paople I work with have supported and loved me through it all and I have learned the true meaning of unconditional love. My youngest daughter is now a 5 year survivor.. I do emergency visits in 2 counties and never know what I will be facing, but this work has allowed me to share with others and to give them support, love, and hope that the family will be able to go on. I know for certain that no one ever really dies. Things happen to me all the time to bring a smile to my face. I just dealt with the dealth of my friends daughter (in her 30’s). Her mother and I were friends from 7th grade all the way through high school. We re-connected recently and shortly after, her daughter’s cancer came back after 10 years. It was heartbreaking, but I know God uses me to help pother people — maybe that is the answer for what happened to me. It was too cooincidental that we reconnected just in time for me to assist them in getting help for her from the best doctors. I think that the leeson is that in helping others to heal, I heal myself. You are a beautiful spirit and your testimony is strength for so many others. I pray for your continued strength, peace and love to fill your heart, mind and soul.